The most comfortable pillow I own. It is firm while not being overstuffed and hard as a rock. I’m planning on buying a second one soon. Highly recommend. Feel refreshed every morning after sleeping on this goose down pillow from Bio Sleep. 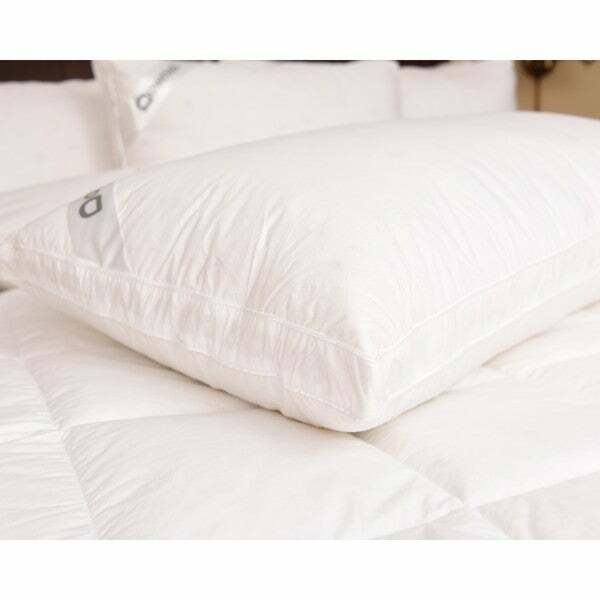 The 330-thread-count cotton sateen cover is super soft to pamper delicate facial skin as you sleep. A special Puresan cleaning method removes allergens, bacteria, and dust so people with allergies can use the pillow safely. These pillows unfortunately are falsely advertised as goose down. When I read the tag on the pillows, I realized that they have two chambers. The outer thin chamber has a minimum of 85% down (15% goose feathers) and the larger inner chamber is 95% goose feathers and 5% down. I am returning them as this is not what I paid for. These are very soft pillows and they are exactly what I thought I wanted! They seem to be very good material as they do not shed and the outer material is soft but they have zero support when sleeping in them! I can fold them over and then they are perfect!! I think I may prefer medium instead of soft but they do fluff up and look nice on the bed!! Have been looking for pillows that will fit the budget for a long time. These are better than expected. They are medium firm but very soft, great down fill. Paired these with bamboo sheets and it is heavenly. 8 months to write this review. Shame on me. There are so many people out there that could be sleeping soundly on this pillow. It is one of the best I have ever slept on and I am over 70. Always remember my mothers down pillows and have wanted this for ages. It is so luxurious. When it disappears for a few hours, I know where to find it. My daughter loves it too. I'll be getting her one of her own. I bought these as extras for our bed but we liked them so much they are our go to pillows for a perfect nights sleep. Hard as a rock and stiff. Not soft down at all. Laverne k.
I have been using the Downia Down pillow for a week. If feels full, holds its support through the night. Best pillow I have purchased. Described as medium firm, but so soft, that I sink into the pillow. However, I am very allergic and these pillow are definitely hypoallergenic. This is the first time in my life I have slept with a single pillow instead of stacking two. The pillows have a high loft but still feel soft. The quality really impresses me. These are expensive, but they are definitely worth the extra cost. My son and I love these pillows. They felt too stuffed at first but are now just perfect! DOWN PILLOWS ARE A TREAT YOU SHOULD NOT PASS UP ! TREAT YOURSELF LIKE A QUEEN WITH THESE ! "Are those pillows firm? Are they 100% goose down or are they mixed with feathers?" These pillows are in the medium range. They are not traditional soft down pillows where your head sinks way down and becomes enveloped. This is a two pillow system. There is a core feather and down pillow inside and the outer pillow is all down. "Is this product sprayed with flame retardants or other chemicals?" looking for an overstuffed down pillow, hopefully this will work.